The Usambara Weaver was formally described by William Lutley Sclater, a British zoologist and museum director. The Usambara Weaver was collected by Reginald Ernest Moreau, an English civil servant and African ornithologist. 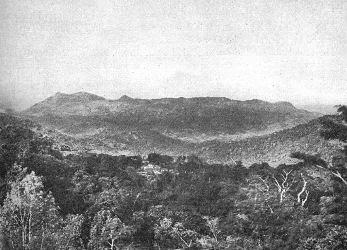 In 1928 Moreau moved to the East African Agricultural Research Station, Amani, where he at first worked in the accounts department. Mr. Moreau wrote on 22 June 1931: "We have just got a Weaver here which beats me completely. The bird was the male of a pair that looked alike, and it was obtained just outside my office, i.e., at the edge of the forest. We have seen the bird perhaps hail a dozen times in the three years we have been here, and have always been puzzled by it." Later Moreau wrote that he had asked his African collector to keep a look-out for this weaver. The collector saw the bird one evening in the immediate vicinity of the laboratories and he pursued it through the plantations in the twilight, eventually obtaining the male type specimen. In September and October 1931 an immature male and female were obtained in Cedrela-trees in a clearing about five miles north of Amani, confirming that this was a new species, and not an Olive-headed Weaver. Before moving to Tanzania, Moreau had lived in Egypt where he had met Michael John Nicoll who was the director at the Giza Zoological Gardens. Nicoll had provided much help and encouragement in the study of ornithology to Moreau. 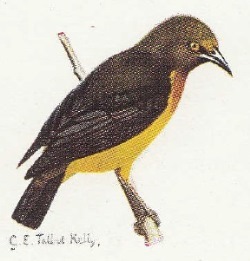 When Moreau sent the Usambara Weaver type to the British Museum, he asked that this bird be named after the late Mr. Michael John Nicoll, to whom he was indebted. The Usambara Weaver was first illustrated by Mackworth 1955a, and then not again until the advent of modern bird field guides. Ploceus (Symplectes) nicolli	Sclater 1931a,	Bull. Brit. Orn. Cl. 52 p.26,	Amani, East Usambara Mts., NE. Tanganyika. nicolli, Named after Michael John Nicoll (fl. 1924) who helped Reginald Moreau during his long residence in Egypt. 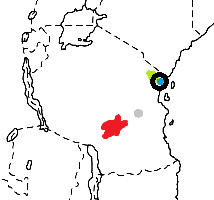 Amani, East Usambara Mts., Tanzania. The types are in the British Museum of Natural History (BM 1931.5.7.6).